Up until her PBS days I hadn’t followed Paula Poundstone at all, but a recent Google search revealed her dark troubles with the law. A lot of comics booze it up at some point in their career anyway so I didn’t let that cloud my judgment. Poundstone wasted no time connecting to the Vancouver audience by bringing up the latest Britney Spears concert, and investigating the matter by asking the audience what really went on. “Weed,” the majority stated. “We are famous for it.” “Really?” she said, acting naïve to BC culture. Commenting on the California education system, Poundstone mentioned how, when her un-motivated daughter asked what she can look forward to as a young adult, she quipped that she can be “tried as an adult.” She also talked about cheap ways to avoid the ridiculous US medical system—“… I got my broken wrist X-rayed at the carry-on scanner at the airport…”—to making a self-diagnosis by watching now legal TV pharmaceutical ads. This was the evening: chatting with the audience in a relaxed manner and sprinkling in some planned topics and some improvised banter on the huge scuff mark on the stage (“… did Liza Minnelli trip? She was just here two nights ago!”). 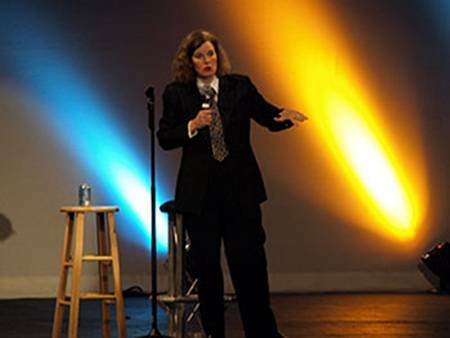 The comedian’s relaxed quirkiness shone through when she turned her back to the audience sighed and said “Ah… nothing.” It’s unfortunate their weren’t more people to see that Poundstone still has that warm, quirky demeanor that I remember coming through in her PBS days. That comedic spark hasn’t left. This entry was posted in events and tagged Paula Poundstone, River Rock, Vancouver comedy show reviews, Vancouver comedy shows. Bookmark the permalink. I wanted to thank you for such a nice piece on Paula’s show. I’m glad that you enjoyed it. Would you like me to send you her new CD? Maybe you could review it. OUT NOW: PAULA’S NEW COMEDY CD.